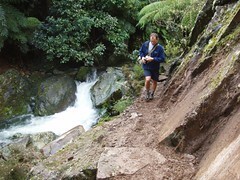 An extensive network of over 70 kilometres of tracks have been cut through most of the Brook Waimarama Sanctuary site. The main purpose of these tracks is to provide a network to allow access to the teams involved in checking and clearing the pest traps and monitoring stations. Teams of volunteers are working every week at the Sanctuary cutting, shaping and upgrading tracks. There is a keen and committed group of members involved in track building. They say it is very satisfying to help open up access to beautiful native scenery so close to the city centre.